This isn’t fair. I’m not doing it to be fair. This is meant to be an example of just how unrealistic we are when we look at prospects. The Hall of Fame class of 2014 will be announced on Wednesday, and for reasons I neither want to get into here nor care much about, it’s going to be one of the more controversial classes in years. Like everyone, I have my opinions on who should be in, but generally, the Hall of Fame isn’t my scene. I’m actually dreading the discussion for the remainder of the week, much like I have grown to despise the chatter and release of terrible ballots that has taken over the past few weeks of baseball talk. The offseason is long and barren. Thank goodness for the holidays. So much as I do with most baseball topics, especially when the news is slow, I put a prospect spin on things. That’s tough to do when it comes to the Hall of Fame without creating unreasonable expectations. But limiting expectations is exactly what I intend to do, and I’m going to do that by predicting which prospects have the potential to he Hall of Famers when it’s all said and done. It is an impossible task. The road to the Hall is way too long and has too many potential pitfalls for anyone to reasonably predict that a 19-year-old will successfully traverse it. But we do know what it takes to be a Hall of Famer. We know that fewer than one percent of major league baseball players achieve it, and probably fewer than five percent of all prospects even have a chance, even if they reach their ceiling. And as we all know, many prospects fall well short of their ceilings. To be a Hall of Famer, a player has to be among the best in baseball at what he does for an extended period of time. There are those, the stat-accumulator group, who are good for a long time and hit certain milestones along the way (Don Sutton, for example), but it’s impossible to project who that may be from a group of teenagers. For the point of this comparison, I’ll stick with the small handful of players who have the potential to be among the truly elite within the game for the better part of a decade. Not even every top prospects fits into this category. For instance, Nick Castellanos will take over this spring as the Detroit Tigers’ starting third baseman. He’s a fine prospect, one who comes in somewhere near the top of most preseason lists. He is one of the best 50 prospects in baseball, but I’m pretty comfortable saying that he’s not going to be a Hall of Famer. He should have a fine career, but his ceiling is limited enough that we can’t project such high accolades. Without truly high-end power, defense or speed, there’s just not enough there to even allow for the possibility. This, however, is not a knock on Castellanos. Remember, the vast majority of players aren’t Hall of Famers. So who does have a chance? The most obvious candidate is Twins minor leaguer Byron Buxton, the top overall prospect in the game. If not him, then who? Buxton is an actual five-tool prospect (unlike many who are incorrectly assigned that title), and is the closest thing we have to the Next Mike Trout. We can confidently project Buxton as a plus defender in center field and as a player whose speed will allow him to add significant base running value. He’s one of the most refined hitters in the minors and is growing into above-average power. Because of his speed and defense, he doesn’t have to hit as well as many other players to get into that five-to-seven win-per-season range, but he’s of capable of doing that and more. What makes him the kind of prospect you can put on a list like this and not get completely scoffed at is that he can fall slightly short of his ceiling and still make multiple All-Star teams. The ability to be among the best without truly being your best is the mark of a Hall of Famer, and Buxton’s ceiling is high enough to do that. 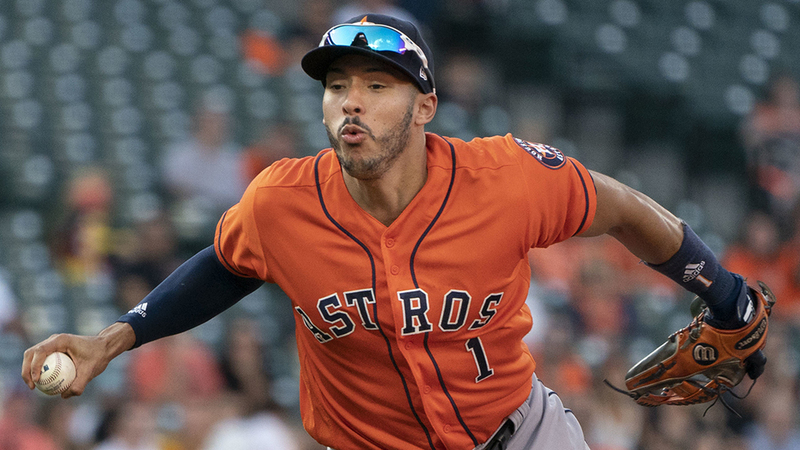 Buxton’s breakout 2013 season had many questioning the Astros’ decision to pass on him with the first overall pick in the 2012 draft, but they’re not exactly disappointed in Carlos Correa, the player they took one pick ahead of Buxton. Correa has power potential that could lead to impressive home run numbers. The big question, from this perspective, is whether he’ll stay at shortstop. If he has to move to third base, where he should be a very good defender, his bat will be merely very good as opposed to Hall of Fame-worthy. Correa’s hit tool is fantastic and he controls the strike zone well for a player his age, giving him a chance to hit .300 regularly with good power. If he can play a decade of shortstop, that puts him in the Ripken/Jeter class of comparisons and gives him as good a chance as any 19-year-old could have. The only other player in the minors with the pure hit tool on par with Correa and Buxton is Oscar Taveras of St. Louis. What these players have in common is that they control the strike zone, have strong plate discipline, and don’t rack up big strikeout numbers. That’s the best way spot a plus-hitter without having seen him in person. Taveras puts the barrel of the bat on the baseball better than perhaps any player in the minor leagues, and better than most of his major league counterparts. There’s no reason he can’t hit .300 over the course of the next decade. With Taveras, the questions are about how much power he’ll develop—as a corner outfielder, he’ll need it—and whether he can stay healthy, having missed a significant amount of playing time as a professional. Trying to pick pitchers for this exercise is even more difficult, because pitchers’ success is based more on the development of particular pitches than on physical tools. There’s so much more uncertainty that it’s an even bigger stretch than the one I’m already taking. You could make a case, however, for Archie Bradley (Arizona) or Taijuan Walker (Seattle), but I’m not comfortable doing that for any pitcher, even by the outrageous standard of this exercise. There are other prospects who could develop well past where we project their ceiling. The three I discussed above have so many hurdles to overcome just to become major leaguers, then everyday players, then All-Stars, that trying to predict a Hall of Fame career from them is a fool’s task. But the point this fool is trying to make is that most prospects don’t project to be anywhere near as great as the players we’ve over-discussed over the past month, but that doesn’t make them any lesser prospects. Most players don’t become Hall of Famers, but a player who projects as a mid-rotation starter is a valuable commodity to have. We get caught up following prospects the same way we do discussing Hall of Famers because we’re passionate about the game, but it’s important to keep the expectations within reason from the start of a career to the finish. Ty Cobb hit .240 with an adjusted OPS of 86 (i.e., his OBA/SA was 86% of the league average) in his rookie season, when he played in less than half the games. Come on. Pick up books that forecast minor league players and look at all the “can’t miss” hyped players, and then see names that are stars now, after ten years of play. No way to forecast players that can stay healthy, keep their heads, and are able to adjust, and continue to readjust over 15-20 years. Yes, you did qualify the articles as really not being “for real”, and I enjoyed it. For those that believe that it’s possible to go so far, I already know that you’ll learn Seriously, though, terrific article! It seems to me that Kevin has summed up Dan Uggla very well with that Bill James observation. Bill James used to point out, among others, that when “older hitters” start to walk more, and hit less, it was a sign of lack of bad speed, coupled with the “batting eye”/reflexes going. This often preceded to be the “swan song” of a players career, when the pitchers started to catch on….. The End. I think Kris Bryant could be added to this list.